My husband, Marc, just turned 27 today. As usual, he didnâ€™t let (and didnâ€™t like) people to know. He just went on a day trip for a client meeting with a friend, who had absolutely no idea that heâ€™d be sharing his car with a birthday boy. I really donâ€™t know how he managed to keep that to himself (I always made sure my closest friends remembered my birthday! Hehe). And to think he had kept on reminding me of his upcoming birthday for two months. Marc had managed to weedle out two â€œadvanced birthday giftsâ€ from me: letting him buy a Nikon D40x and a ludicrously expensive Crumpler camera-laptop bag. Itâ€™s a good thing we already have Paypal here in the Philippinesâ€”I was able to get my blog earnings way earlier than cashing in checks, so I didnâ€™t feel too bad about spending that much for a ludicrously expensive bag. Iâ€™m going to keep on repeating itâ€™s ludicrously expensive because I really think itâ€™s ludicrously expensive. If we spent our hard-earned money from web design for that ludicrously expensive bag, Iâ€™m probably still whining about it now. Itâ€™s just a ludicrously expensive luxury, you know? Itâ€™s not like our camera and laptop will melt or something if we didnâ€™t put them in that bag. I am the type of person who would appreciate any gift (especially when it came from the giverâ€™s heart), but I always preferred to give gifts that have practical use to the receiver. I donâ€™t know, but I just feel that giving them gifts that they will really use somehow shows that I really meant to give itâ€”I didnâ€™t pull it off a shelf and wrap it up just to be able to give something. Thatâ€™s why I find it really hard to think of gifts for guys. I have always thought it was a gender thing. If youâ€™re a girl, you know what youâ€™d like to have so itâ€™s easier to figure out what your girlfriend would like to have. Buy them a pretty blouse from a tiangge, and youâ€™re doneâ€”you donâ€™t need to wonder if theyâ€™ll find it useful, because you know that itâ€™s something that they would wear. Body spray, same thing. But guys? I donâ€™t find it as easy. For one, Iâ€™m not a guy. I donâ€™t really know what a guy would like to have, or rather, what a straight guy would like to have (I find it easier to think of gifts for guys if theyâ€™re gay). The female side of our Christmas list is ready for shoppingâ€”I just need to find time to buy them. But not the male side. Itâ€™s not as easy as going to Body Shop and getting them those bath package things. Body spray? Um, Iâ€™m not a guy, but I sure wonâ€™t like to get an Axe deo-cologne for Christmas (itâ€™s like saying â€œey you stink so Iâ€™m giving you an Axe deo-cologne to combat your awful body odorâ€). What gifts do you give guys that theyâ€™ll be able to use? I honestly have no idea. A little help will be appreciated. Any ideas? This entry was posted on Thursday, 13 December 2007 at 4:11 am and is filed under Birthdays, Holidays, My Family. Finally, I have my very own Christmas tree! NGEK!! it was his birthday!?!?!?!?! halu! i can’t help but comment, ang ganda naman ng crumpler, i’ve been wanting to buy one also, not for me but for my dad, kasi luma na his camera bag, kaya lang nga, i totally agree with you, its so expensive parang di ko kaya bilhin hehehe : ) anyway, congrats on the nikon d40x! 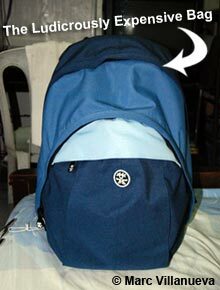 You should also check Victorinox’s laptop backpacks. It’s slightly more expensive but the design and material is super excellent.